When I learned how to make Chinese pork recipes I never realized how important this meat is to the people of China. When I was growing up Dad always raised hogs. Pork was a staple in our diet and I always related the United States as being the big consumer of pork. Since then I learned that many countries in South America eat a lot of pork. Lately I have been reading about how much pork is used in China. Actually China is the largest consumer of pork in the world. As you learn how to make Chinese pork recipes, you will quickly discover how delicious this meat is with the many different flavors of China. Much of the pork served here in the United States is also prepared with those delicious flavors of China. If you like the mild light seasonings of the Peking cuisine, garlic, green onions and leeks are used to season along with the generous use of soy sauce. You might choose to serve this pork with delicious noodles, in steamed dumplings or ground in spring rolls. The Western Szechwan cuisine is my favorite. I love the robust spicy pork dishes of this area. Garlic, green onions, fennel, Sichuan peppercorns, hot chili peppers and gingerroot are often combined to achieve this taste. The red cooked pork of the Shanghai cuisine and the sweet and sour pork of the Southern Cantonese region are also very tasty. Although these are a little milder in flavor they are still seasoned well. Since I learned how to make Chinese pork recipes and in all my Chinese cooking, I found a good brand of soy is a must both in preparation and as a side for serving. Learn how to make Chinese pork recipes with this favorite sweet sour flavor. Brown pork in hot oil; add water, cover and simmer slowly until tender about 45 minutes. Combine sugar and cornstarch; add pineapple liquid, vinegar, soy sauce and salt. Add mixture to the pork; cook and stir until liquid thickens. Add pineapple chunks, green pepper and onion; cook 2 to 3 minutes. Serve over hot cooked rice and top with crisp noodles; serves 6 to 7. 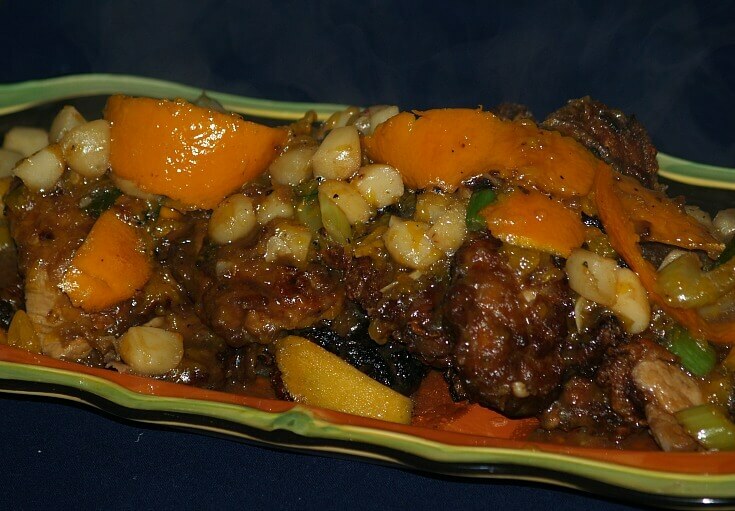 When I learned how to make Chinese pork recipes this orange Szechuan became my favorite. Combine finely chopped green onions, ginger, 3 tablespoons soy sauce, sugar and ¾ teaspoon Tabasco sauce in shallow dish. Add pork pieces and turn to coat; cover and refrigerate at least 3 hours. With a sharp thin knife remove peel from oranges; remove all white membrane from peel. Cut peel in long thin strips and set aside. Cut out sections from oranges and set aside. Heat 1 cup peanut oil in a large heavy skillet; coat pork with cornstarch and fry 1 to 2 minutes on each side. Drain pork on paper towels; set aside on warm platter. Heat 2 teaspoons oil in the skillet; stir fry orange peel and celery 1 ½ minutes. Add orange juice, green onion pieces, 2 tablespoons soy sauce, ¼ teaspoon Tabasco sauce and water chestnuts. Bring mixture to a boil (Add more Tabasco if desired); add pork pieces and toss to coat evenly with sauce. 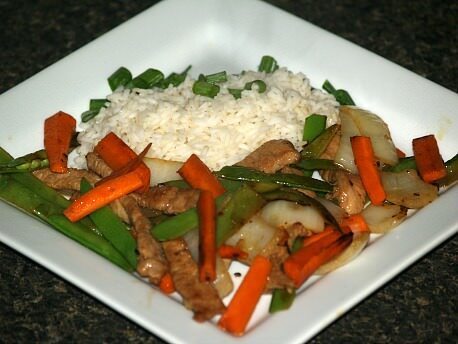 Learn how to make Chinese pork recipes economically and filling by serving with rice. Sprinkle pork chops with ¼ teaspoon salt, pepper and ¼ teaspoon of ginger. Heat oil in a large skillet; add the chops and brown. Add to the skillet the rice, ½ teaspoon salt, soy sauce and ¼ teaspoon ginger; stir well. Cover skillet, reduce heat and simmer 20 minutes. Add to skillet the green onions, celery and green bell pepper. 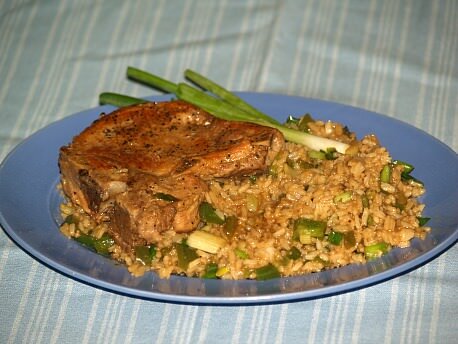 Cover skillet and simmer for 10 minutes until pork chops are tender; serves 4. If you learn how to make Chinese pork recipes you will find that pork and chicken make a great combination. In a large Dutch oven combine pork, chicken, water, vinegar, garlic, soy sauce, salt and pepper. Bring Dutch oven mixture to a boil; reduce heat, cover and simmer about 50 minutes until chicken is done. Remove pork and chicken from the Dutch oven; skim fat from broth. Cook broth uncovered until reduced to about 1 cup. Add pork; cook and stir until browned. 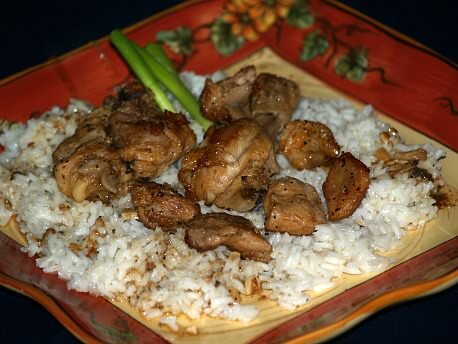 Serve pork, chicken and broth over cooked rice; serves 6 to 8. 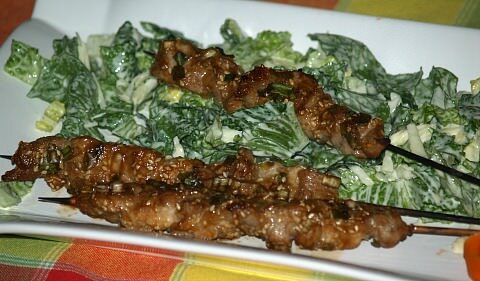 When you learn how to make Chinese pork recipes you will find many great ones to serve as appetizers. 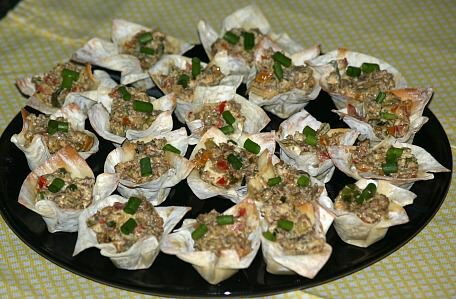 Lightly press wonton wrappers on bottoms and up sides of miniature muffin cups. Bake for 5 minutes or until edges are browned. In a large skillet cook sausage over medium heat until no longer pink; drain. Stir into mixture the cheese and remaining ingredients . Spoon a rounded tablespoon of mixture into each miniature wonton cup. Bake for 6 to 7 minutes or until thoroughly heated; makes about 48. 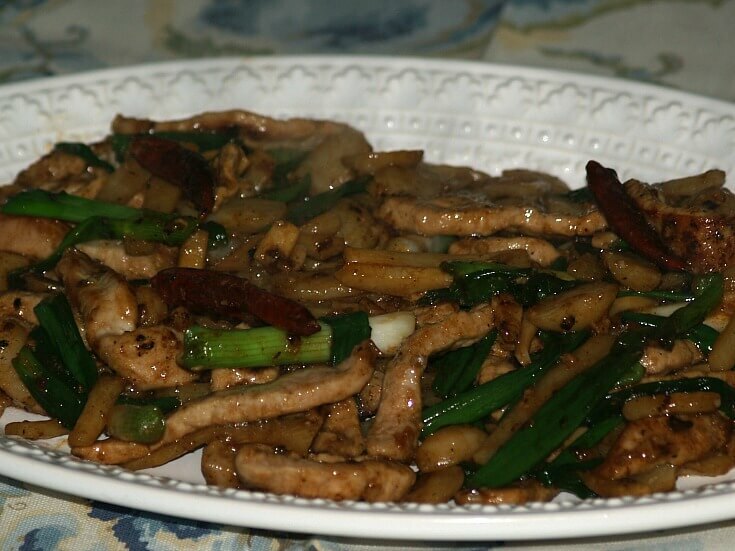 The spice with pork strips make a delicious meal when learning how to make Chinese pork recipes. Slice pork into ¼ inch thick strips about 4 inches long. Thread pork onto bamboo skewers keeping meat as flat as possible. Arrange skewers in a large shallow pan. Combine and blend the soy sauce, green onions, sugar, sesame seeds, water, ginger, hot sauce and garlic. Pour mixture over the skewers turning to coat all sides; let stand 30 minutes turning over occasionally. Remove skewers to a lightly oiled broiler rack; RESERVE MARINADE. Broil for 3 minutes until pork is tender turning and basting with marinade 1 time. Makes 6 to 8 appetizers. Learn how to make Chinese pork recipes from the Szechwan cuisine. In a bowl combine cornstarch, salt, pepper and sherry; add pork and stir to coat. Stir in 1 ½ teaspoons of the oil; let stand for 15 minutes to marinate. Heat wok or large skillet over high heat; add 2 tablespoons of the oil. Add garlic, ginger and chili peppers to skillet; stir one time. Add pork and stir fry until pork is lightly browned about 4 minutes; remove from pan. Heat remaining 1 tablespoon of oil; add bamboo shoots and onions; stir fry for 1 minute. Return the pork to the pan; stir cooking sauce and add to the skillet. Cook and stir until the sauce bubbles and thickens; serve with cooked rice, noodles or with Asian buns. 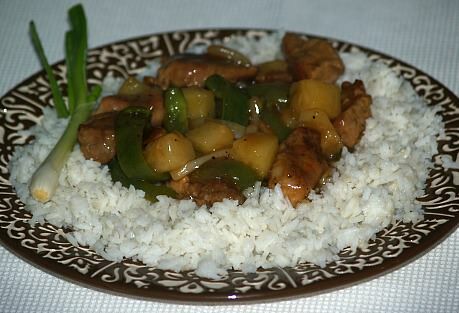 When you learn how to make Chinese pork recipes this meat makes a great stir fry just like chicken or beef. Combine 1/3 cup of stir fry sauce, vinegar and red pepper; set aside. Coat pork with the 1 tablespoon of stir fry sauce. Heat 1 tablespoon of oil in a large skillet or wok over high heat. Add pork to skillet and stir fry 2 minutes; remove pork from pan. Heat remaining 2 tablespoons of oil in same pan. Add carrots, onion and peas and stir fry 4 minutes. 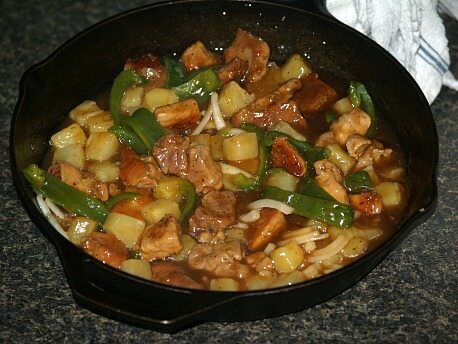 Stir in pork and stir fry sauce mixture. Cook just until pork and vegetables are coated with the sauce. Serve immediately with hot cooked rice; serves 4. 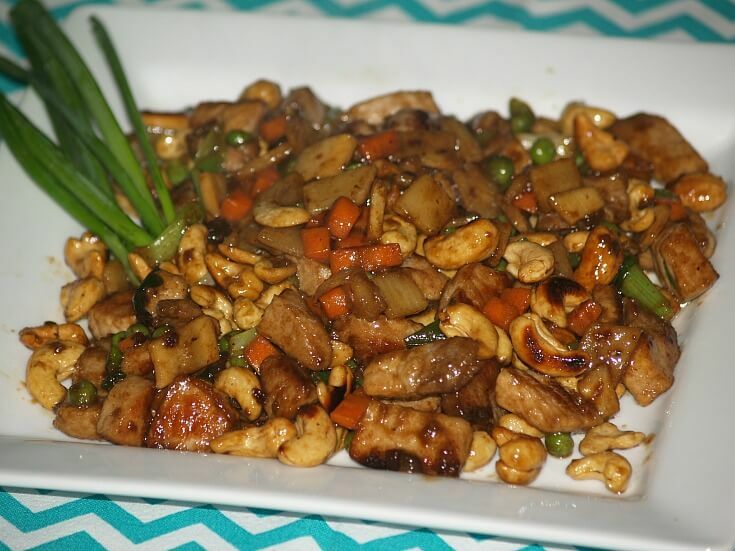 As soon as I learned how to make Chinese pork recipes I added my favorite nuts to make a great entree. In a small bowl combine cornstarch, sherry and soy sauce; add pork and stir to coat. Stir in 1 ½ teaspoons of the vegetable oil; let stand for 15 minutes. Drop carrots in boiling water for 5 minutes; drain and set aside. Prepare cooking sauce; set aside. Heat a large skillet over med heat; add 1 tablespoon of the oil. Add cashews to skillet; stir fry until golden about 1 minute. Remove cashews from the skillet; set aside. INCREASE heat to high; heat remaining 2 tablespoons of the oil and stir in ginger. Add pork to skillet; stir fry until pork is lightly browned about 4 minutes. Add carrots, bamboo shoots and peas; stir cooking sauce and add to the skillet. Cook and stir until sauce thickens; stir in cashews before serving. 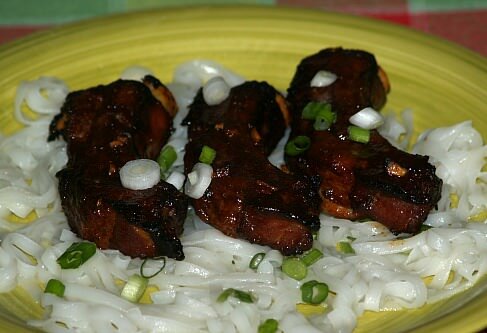 Learn how to make Chinese pork recipes like these barbeque pork ribs. Separate ribs between the bones; place in a shallow glass dish. Spoon mixture over the ribs; refrigerate for 2 to 3 hours. Line broiler pan with foil; place ribs in single layer meaty side up on top of broiler rack. Brush ribs with remaining marinade; cover and bake for 1 hour. Brush with more marinade; bake 45 minutes longer until tender. NOTE: Brush occasionally with marinade.